Question: What has twenty-five pairs of legs, eyes, ears, and hands and will help to make your season bright? Answer: The combined voices of The Victoria Good News Choir, special guests and YOU. 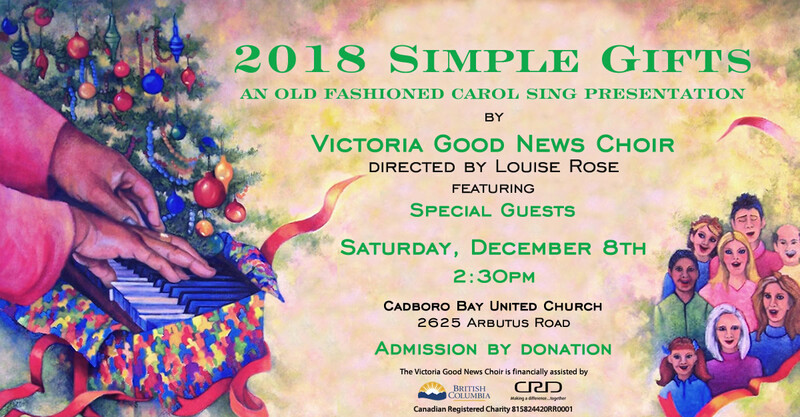 How: In the 2018 Simple Gifts – An Old Fashioned Carol Sing presentation. When: Saturday, December 8th, 2018 at 2:30pm, doors open at 2pm. Where: 2018 at Cadboro Bay United Church, 2625 Arbutus Road, Victoria, BC, Transit info #11 Bus, Sherwood Road stop. Admission by Donation at Cadboro Bay United Church. It’s as simple and beautiful as the most favourite gift you’ve ever received. No strings attached. Bring your friends, family and neighbours. Make this your simple gift to them.